It’s the Sweetest Gift of All. It is Valentine’s Day and love is in the air! Chocolates, roses, and dinner reservations abound. Red and pink envelopes with hearts and kisses strewn across the seal crowd mailboxes and desktops. Unfortunately, it’s not the heart-shaped chocolates, or a card that will win me over. I don’t want flowers or jewelry, because honestly none of that will do. (Sigh.) I imagine that makes me a difficult case when planning for Valentine’s Day. If I don’t want all those popular mid-February trappings, then what do I want? School gardens. 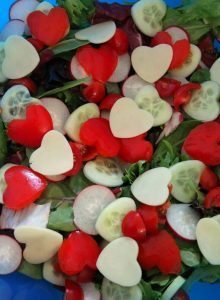 Bright green veggies and fresh heart-shaped peppers on the lunch tray. Kids with soil under their fingernails, and smiles planted across their faces. I want farm to school activities in every district across Illinois. I want kids to know where food comes from, to recognize and enjoy fresh veggies, and to learn how to grow food and fall in love with the experience. I want to change how we view the school lunch tray. Stubborn? Difficult? Take your pick. So, if you are looking for an out-of-the-box way to say, “I love and support you” think school garden. Start a conversation with your local K-5 science or art teacher, or approach a master gardener in your area. Get the ball rolling and peek their interest with a fantastic and successful program to build lifelong, healthy eating habits in children. Bring school administration onboard by connecting garden work to the mandated school wellness policy. Make your K-5 school your valentine project, and watch the magic happen with every seed they plant, and every vegetable they pull from the ground. Once that garden is established, connect it to the lunch program- and grow veggies for the lunch tray. It can become your garden of love and support, and a never-ending valentine to the kids in your school district- so much more satisfying than a heart-shaped chocolate. Will I see you in the garden? Do you need additional information on school gardens or the farm to school program? Join us for Farm to School Day on March 3. Experience gardening lessons and all things farm to school. Find out more and register here. Building a Recipe for Picky Eaters: One garden trowel, seeds and a little sunshine.